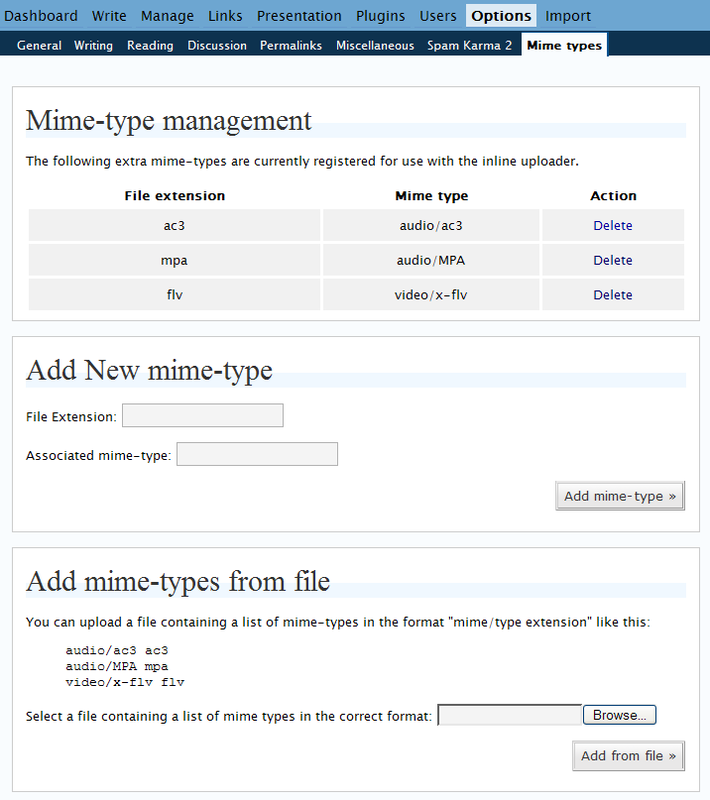 This plugin allows you to configure extra mime-types for support by the inline-uploader. A new options page is added as Options … Mime-types which allows you to add/delete the extra mime-types. By default the following extra mime-types are registered: audio/ac3, audio/MPA and video/x-flv. This plugin requires WordPress 2.0 or later to function as it relies on the existence of the inline-uploader. With WordPress 2.0.4 or later the plugin will also use the builtin nonce protection for all actions. Here is a working link to the post on the plugin. Thank you for this plug-in. I have been tearing out what’s left of my hair trying to upload SmartNotebook files to my site. This fixed the problem in less than 30 seconds!